For most of her life, Catherine Friend was a carnivore who preferred not to consider where the meat on her plate came from. Beef didn’t have a face, chicken didn’t have a personality, and pork certainly shouldn’t have feelings. But Friend’s attitude began to change after she and her partner bought a farm and began raising sheep for meat. Friend’s ensuing odyssey through the world of livestock and farming is a journey that offers critical insights for omnivores and herbivores alike into how our meat is raised, how we buy it and from whom, and why change is desirable and possible. From a distressing lesson about her favorite Minnesota State Fair food (pork-chop-on-a-stick) to the surprising gratitude that came from eating an animal she’d raised and loved, Friend takes us on a wild and woolly ride through her small farm, with several brief detours into life on factory farms. Along the way, Friend raises such questions as: What are the differences between factory, conventional, sustainable, and organic farms, and more importantly, why do we need to understand those differences? What do all those labels — from organic to local to grass-fed and pasture-raised — really mean? If you’re buying from a small farmer, what are the key questions to ask? How do you find that small farmer, and what’s the best way to help her help you? 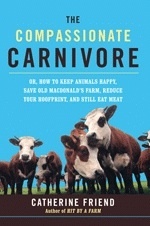 In the same witty and warm style that characterized her memoir, Hit by a Farm, Friend uses her perspective as a sustainable farmer and carnivore to consider meat animals’ quality of life while still supporting the choice to eat meat. Regardless of whether you eat meat once a day, once a week, or once a year, your perspective of what goes on your plate — and in your mouth — will never be the same.